See you at MSC 2015? Adipose- and Bone Marrow-Derived hMSCs: What's the Difference? RoosterBio participated in the annual Tissue Engineering and Regenerative Medicine International Society’s Annual Meeting of the Americas chapter (or TERMIS-AM for short) in Dec 2014. You can find a lot of content on the meeting at the conference website where you can download the program for free, as well as read the published abstracts in the journal Tissue Engineering. The final registration numbers for the 2014 TERMIS-AM conference in DC was 842 (about a 7% increase over last year’s conference). There were 30 countries represented at the conference, with a total of 202 oral presentations and 338 poster presentations (Stats from Sarah Wilburn at the TERMIS head office). We are looking forward to the 2015 TERMIS World Congress, which will be in Boston in early September, 2015. There were two striking trends that were gleaned from the conference that I wanted to outline over a couple of blog posts. First, there was a noticeable rise in the number (and quality) of the Biofabrication-related talks and posters (this blog post will focus on this). The second trend to note was the rise in Product Development content at the 2014 meeting – and this will be the focus of a subsequent blog post. Interestingly, the intersection of these two topics (manufacturing process technologies and product development) has traditionally been crucial for the successful commercialization of high tech products, including biopharmaceuticals (see recent HBR article by Pisano and Shih here). showing off the beta version of the BioBot Rapid 3D Bio-Prototyper. “commercial implications” of the technology presented, while great scientifically and very interesting, were of minimal relevance to anything marketable in a short/commercially-relevant time frame. I believe that was due to the relatively slow progression of tissue engineering technology over the years, as brand new supporting tools and technologies had to be worked out before the field could begin to accelerate. However, a few key themes have been emerging. First, cellular therapies and engineered tissues are working their way through the clinic and are paving the commercial and regulatory roads for living cell-based products that will be regulated as biologic-based devices. Second, production and assembly technologies for complex 3D cell-based products (generally referred to as BioFabrication, with 3D BioPrinting being the most advanced) has been progressing at a rapid pace (see recent articles hereand here). Third, and just as important, is the progress of the development of “enabling tools” such as primary cells, biomaterial scaffolds, dynamic bioreactors for tissue growth and development, and cryopreservation and storage technologies. Manufacturing technologies are critical to the future success of commercial products, and the advancement of BioFab/BioPrinting will be central to commercialization. Manufacturing process development was called a key “competitive weapon” in therapeutic biologic products several years ago in Gary Pisano’s first book The Development Factory. What was true for the first protein drugs will continue to ring true for engineered tissues. In the book The Development Factory, it is shown that product innovations typically precede process innovations – and the first tissue engineered products have paved the way for today’s manufacturing innovations. There are several different BioFabrication methods for manufacturing complex engineered tissues – be it cell sheet engineering, injection molding of living tissues, or 3D bioprinting, and these are developing faster than many commercial tissue engineered products. This should have a positive impact on accelerating the development and quality of next generation products. The quicker that Manufacturing technologies evolve, that faster that tissue engineered products will be commercialized. This is admittedly a hypothesis of mine, but it stands to reason that this will be the case - The underlying premise being that most tissue engineered products, even once to market, have had a hard time having a successful business built around them. As manufacturing is automated, standardized and made more robust and reproducible, manufacturing costs can come down. It is now possible for products to be developed in early research with a manufacturing process that could be a go-to-market process, greatly streamlining the eventual commercialization pathway. As I have stated in my earlier posts – Product Development efforts in high tech fields can only move forward when supporting technologies become available that enable Product Development efforts. Today’s smartphones wouldn’t be the products that they are without low cost, high quality, miniaturized and highly integrated sensors, gyroscopes, cameras, GPS, RF and NFC chips, etc…. In that vein, tissue engineering will require high quality, easily accessible, and affordable primary cells (thus, RoosterBio products), Biomaterials, BioPrinting Hardware and Software, Bioreactorsspecifically designed for 3D tissues, and Quality Control (QC) testing technologies. All of these technologies were present in the exhibits by a few companies (see the TERMIS brochure pages 27&28 for full list). • Bose, who has been doing this the longest, had multiple bioreactors for growing engineered tissues under dynamic loading environments that could also be multiplexed for running experiments with multiple variables. You could buy a system for running up to a 6-12 tubular constructs under various flow regimes, as well as stretch systems. 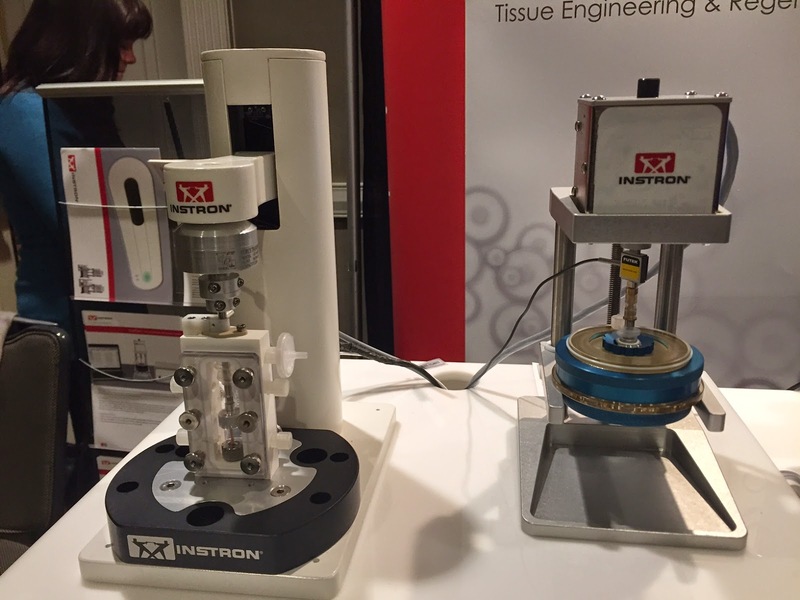 • Instron, the mechanical testing company, has recently acquired Tissue Growth Technologies and are incorporating their sensors and actuators with TGT’s bioreactors. I posted a video of the bioreactor actively stretching a tissue on YouTube here. • MATEsystems, a new start-up had the MATE integrated bioreactor/tester (MATE stands for Mechano-Active Tissue Engineering). They have an interesting system in a 6-well plate format that allows dynamic growth conditions for tissue like cartilage (for growing under compression) that could, in real time, monitor the mechanical properties of the developing tissue. Blow-out of MATE's culture chambers - pretty cool set-up. There was only a single BioPrinting hardware/software company at TERMIS this year, and that was BioBots. BioBots is working on low cost, easy to use additive manufacturing hardware for the printing of cells, hydrogels, and tissues. They were recently named to a list of Top 10 Most Innovative Health Care Startups to Watch in 2015, as well as being a SXSW Accelerator Finalist. They are in Beta-phase and are signing up 20 customers to get their Beta-units for the ultra-low cost of $5000. We have been doing some applications development with the start-up team (see our recent blog post and YouTube video on this here), and they are super high quality guys. If you are in the market, this looks like a great way to get started. 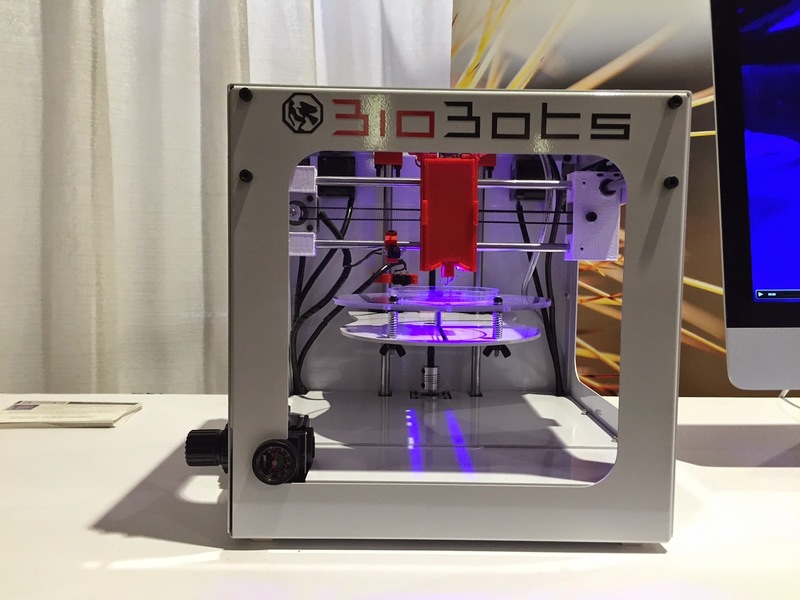 We anticipate seeing more bioprinting companies at tissue engineering conferences very soon. 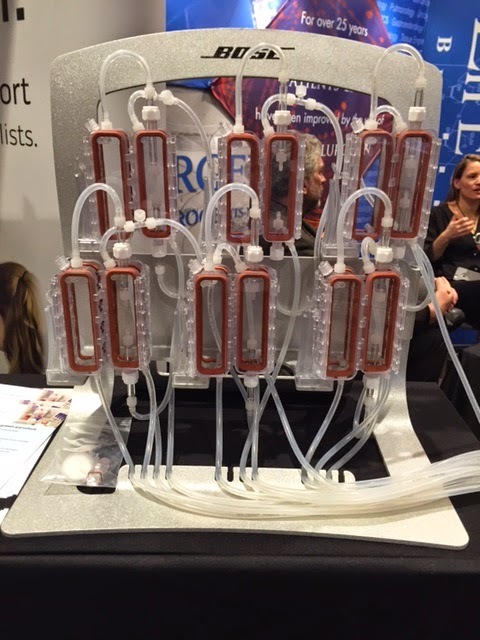 LifeCore Biomedical was there with their GMP quality and highly-engineered hyaluronic acid materials. I have known these guys for over 15 years and have used their materials in the past. There was also a company called beMatrix (Nitta Gelatin) selling low-endotoxin gelatin. FMC BioPolymers/NovaMatrix was initially signed up, but didn’t end up making the show (but they are listed in the brochure). They sell medical grade and engineered alginate hydrogel materials (and full disclosure – they licensed a patent I was on during my PhD). These, and many other, biomaterials are fundamental tools required for any tissue engineering effort. Such companies have been active at tissue engineering and cell therapy conferences, and their presence will continue to be of value. There were a few testing companies that span from mechanical testing (you can count all of the Bioreactor companies here since they had integrated mechanical read-outs) as well as CellScale Biomaterials Testing Inc and PreSens Precision Sensing GmbH, a German company with deep experience making pH and oxygen sensors that are incorporated into cell culture and bioreactors for noninvasive monitoring of cell health during culture. Solid QC is a vital component of moving a tissue engineered product to clinical and commercial success, so hopefully, we’ll see more engagement from this sector as tissue engineered products gain steam in moving to commercialization. There were also several exhibitors in the Cell & Tissue Culture technology area. Companies such as RoosterBio, Stem Cell Technologies, and Tissue Source sell raw materials for research and product development (you could also put the biomaterials companies into this bucket). There were also a couple of companies that develop and market devices for cell processing (Evonik and Kaneka). Again, such companies are going to play a crucial role in helping tissue engineers successfully commercialize products, so keep an eye on them. As the tools for making, developing, harvesting, storing, and testing engineered tissues become more accessible and affordable (as they have over the last several years), we will see a rapid acceleration in the development of new products. If the content, quantity, and quality of Biofabrincation/Bioprocessing presentations at TERMIS this year were any indication of where the field is heading, we think Tissue Engineering will grow tremendously over the next several years (forward looking statement alert!) and are looking forward to being a part of this exciting field!